Your takeout order could be harming the environment. Bangor is considering a way to fix it. 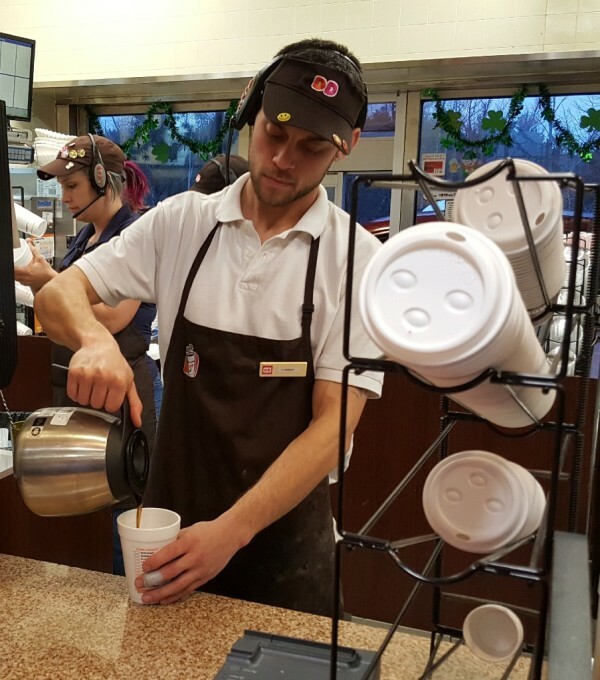 Odlin Road Dunkin' Donuts employee Lyndon Lydick pours a cup of coffee into a polystyrene foam cup for a customer on Tuesday. 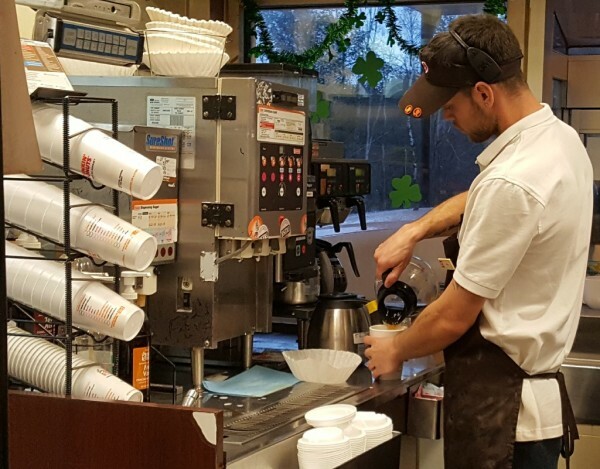 In an effort to reduce the volume of plastic littering, Bangor city councilors are mulling a proposed law banning local merchants from selling food and drinks in Styrofoam cups or containers. If passed, Bangor would join Portland, South Portland and Brunswick in banning polystyrene, the plastic material used to make the brand Styrofoam, according to Ryan Parker, the environmental policy outreach coordinator for the nonprofit Natural Resources Council of Maine, which supports the ban. Dozens of other cities and towns around the country also have enacted such local laws. Several local restaurant owners who package food using the polystyrene containers said making the switch to paper would come with an added cost, and a bill to impose such a ban statewide recently received pushback from several groups, including the Maine Restaurant Association, Maine Grocers and Food Producers Association and state agencies including the Maine Department of Environmental Protection. Bangor councilors also are considering a separate, still undrafted, ordinance that would ban plastic take-out bags from stores and place a 5-cent fee on paper bags, according to Bangor City Manager Cathy Conlow. Seven other cities and towns in Maine also have placed bans or fees on one or both of those materials, according to the NRCM. As it’s written, the proposed law would ban businesses from serving or selling prepared food in polystyrene foam containers and bar retail shops from selling the cups and plates made of the material. Packaging raw seafood in polystyrene would be exempt and the ordinance would not ban businesses from selling food and drinks that were prepared and packaged in the material outside city lines, Conlow said. The city government also would be barred from purchasing polystyrene containers or using such containers on city premises or at city-sponsored events, as would contractors while working on city-funded projects within Bangor. As proposed, the law would carry a $100 to $250 fine for the first offense and a $250 to $500 fine for each subsequent offense. The council’s infrastructure committee voted on Feb. 28 to send the ordinance to the full board, which will take it up for a first reading on March 13, according to City Solicitor Norm Heitmann. The plastic bag ban will likely be introduced during a March 14 infrastructure committee meeting, he said. Polystyrene is difficult to recycle, requiring specialized expensive machinery that is unaffordable to most cities and towns, according to Parker. Instead the material breaks down into small particles, filtering into streams and waterways, he said. In 2013, researchers from the nonprofit Marine and Environmental Research Institute found an average of 17 plastic fragments in every liter of seawater sampled from Blue Hill and Penobscot Bays. In 2014, a study by the same organization found an average 177 pieces of tiny plastic fragments in oysters and mussels, numbers that “may pose a serious health threat to the animals themselves and seafood consumers,” according to a summary of the institute’s findings. “That’s really concerning in terms of some of the most important industries in Maine,” Parker said. Legislators recently considered a pair of proposed bills to ban retailers from distributing plastic bags to customers and to prevent the sale or distribution of polystyrene containers statewide. But elements of the two measures since have been combined into LD 57 and amended to create policies encouraging cities and towns to adopt such ordinances. The amended bill, which is in front of the Environmental and Natural Resources committee, would encourage local cities and towns to adopt reusable bag and polystyrene container ban ordinances. It also would have the state Department of Environmental Protection provide information about such ordinances and create biennial reports starting in 2020, outlining the progress municipalities have made in adopting them. The original statewide ban on polystyrene containers, which would have been the first in the nation, received support during a Feb. 6 public hearing from various residents around the state and several environmental and wildlife organizations including Friends of Casco Bay, the Surfrider Foundation, Maine Audubon and the Natural Resources Council of Maine. It also received a lot of pushback during the hearing from representatives of Maine retailers, restaurateurs and grocers, the Maine Tourism Association and the state Bureau of Land Resources, which is part of the Department of Environmental Protection. Food service container manufacturer Dart Container Corp. testified that polystyrene has better insulation than paper containers, is cheaper, requires less water and electricity to make and can be recycled. Curtis Picard, executive director of the Retail Association of Maine said the bill was targeting retailers when they should be targeting litterers. He instead proposed an organized statewide spring cleaning day. Mark Bergeron, director of the Bureau of Land Resources, also said legislators should focus on bills that encourage litter prevention. “Because the proposed ban on polystyrene containers appears to be without limit, it would affect not only the customer who goes to a deli for a sandwich but also any manufacturer or wholesaler of these products,” Bergeron said. The Bangor Region Chamber of Commerce has yet to weigh in on the proposed polystyrene ban, but it has received mixed reactions from a few local business managers. Nina Xu, manager at Happy China Buffet, said the restaurant uses Styrofoam to package some of its takeout food. She said the material is cheaper than its paper packaging alternatives and easier for customers to use. Mike Matthews, a front-end manager at Umami Noodle Bar, said that with the exception of small water cups for customers, the downtown eatery does not use the material. Matthews agrees with the proposed law because he thinks it’s important for the city to protect the environment and he does not think most businesses would have a tough time making the transition to alternative materials. “Unless you use a lot of it and there’s a huge cost impact, I don’t think it’s going to be that much trouble for a business to turnover,” he said. Nick Bambrick, kitchen manager at Moe’s Original BBQ, said the eatery previously made the packaging switch at its Portland location following that city’s ordinance banning polystyrene. If such a law were to pass in Bangor, there would be a small cost impact to the Bangor location, which still utilizes the material, but the business would be able to adjust, he said. The idea could have a positive impact on the environment, Bambrick said, as long as residents are responsible and recycle their paper products.